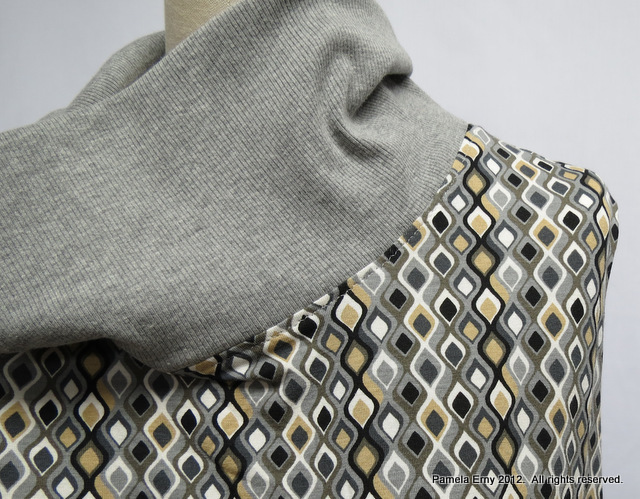 or overlapped and asymmetrical collar to any knit top. First let's talk about the basic garment. 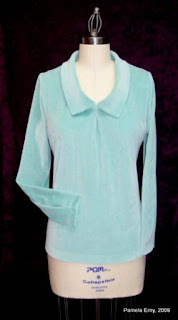 The collar I'll be showing you can be added to any basic knit top. Here are some examples of patterns by Butterick and Vogue that would work with an added collar. Note that the necklines are either "crew" or "jewel" in general shape and depth..in other words..nicely rounded and not particularly deep or wide. 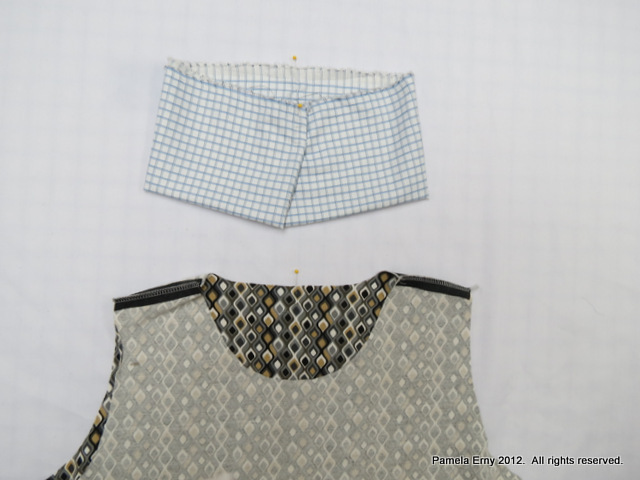 Here are the bodice pieces shown side by side. The front neckline is about 5-6 inches deep. At the end of this tutorial you will see variations that have lower or higher necklines but the construction technique is the same. Because the collar is going to be overlapped and so therefore "scientifically exact" measurements are Not needed, I am going to say that this neck edge is 21 inches around. 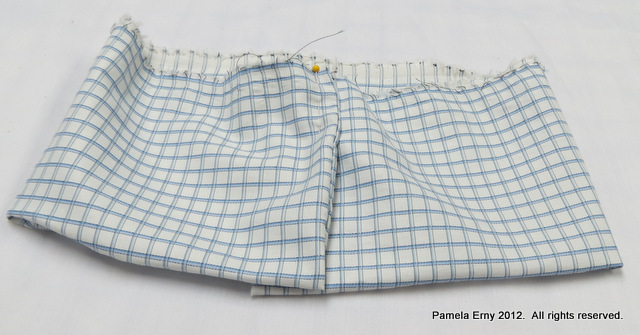 A collar needs to be made that is 21-inches long, plus a generous 3 inches for overlap and to have enough to seam the ends. So the LENGTH of the over-lapped collar needed to fit this particular neckline is 24"...and I usually add an extra inch to give myself a little more overlap. Now what about the width? 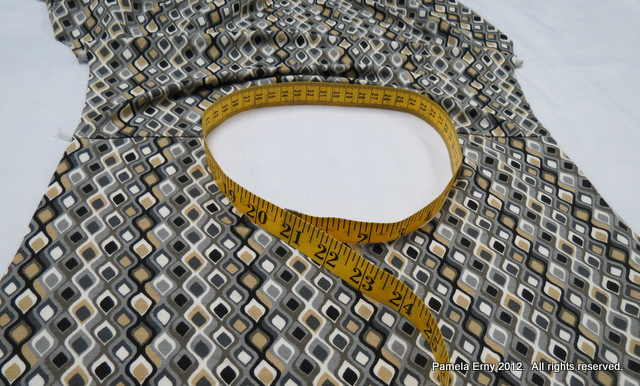 I have made so many of these tops over the years that I know that I like the results best when the cut collar width (flat and single thickness before it is sewn) is 8 inches to 12 inches wide. 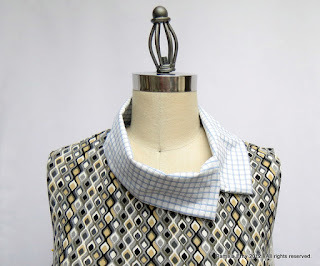 As you will see, this is an arbitrary width measurement, and after you make one, you will see the endless design possibilities by changing the width and shape of the collar. So I have decided that for this top, my collar will be cut 25 inches LONG and 10 inches WIDE. 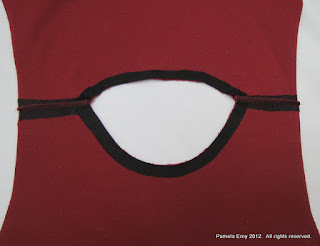 Normally I just go ahead and cut out my collar from the fashion fabric and stitch it in. 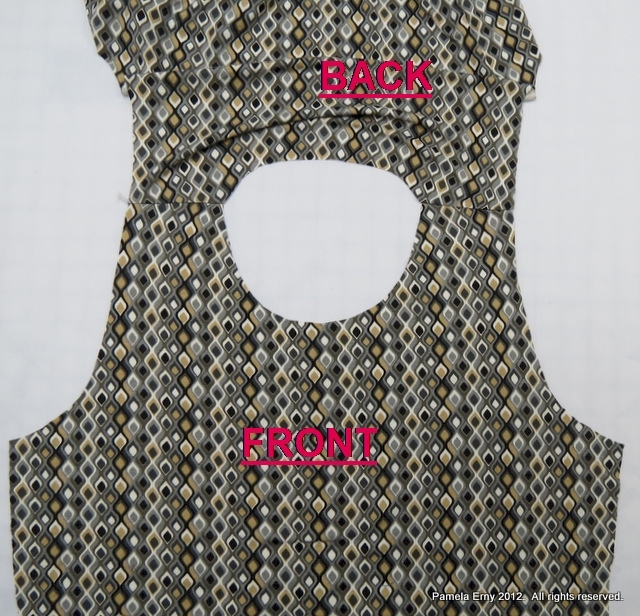 However, you can make a "test" collar from scrap fabric (that you can use as a pattern later) to see if you've measured correctly and like the width and finished folded depth of your collar. Below is a piece of scrap fabric that has been cut to my determined 25- inch length and 10-inch width. The photo below should make things more clear. 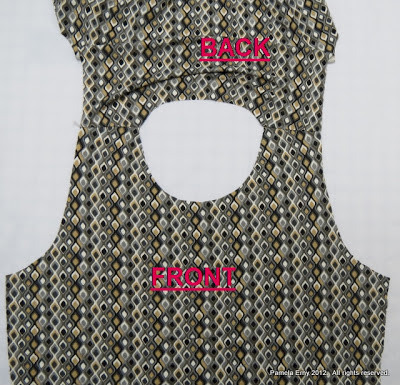 The bodice has been turned wrong side out, and the collar is going to be "dropped" inside of the neckline "hole", all the raw edges will be aligned, and the collar will be basted (by hand or by pins) to the neckline...right side of collar to right side of neckline. ...it is shifted off center before basting, as shown below. The collar as shown below was quickly pin-basted to the neck-edge in a one-to-one ratio (in other words, the collar is the same length as the neckline, neither one needs to be stretched or eased to fit the other). 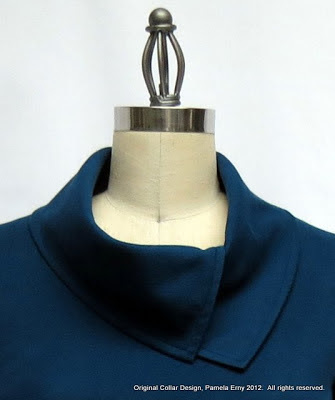 If the collar is a little longer or shorter than the neck-edge, just increase or decrease the amount of the overlap. I was satisfied with the appearance of the collar, and decided to use the same measurements for the "real" collar. 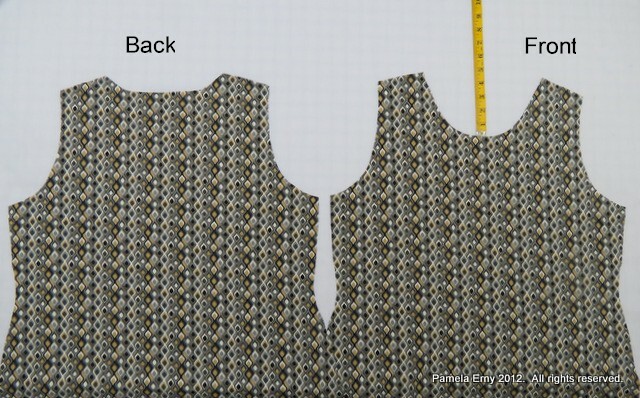 If I had wanted to, I could have quickly taken the stitching out and used the test-collar as the pattern for the "real" collar, but I like to just measure and cut simple rectangle shapes with my ruler and rotary cutter, rather than scissors and a pattern. So I did so with grey ribbed knit The short ends of my ribbed collar were stitched and turned right sides out.....and then I hand basted the raw edges to prevent them from shifting before I stitched the collar into the neckline "hole". 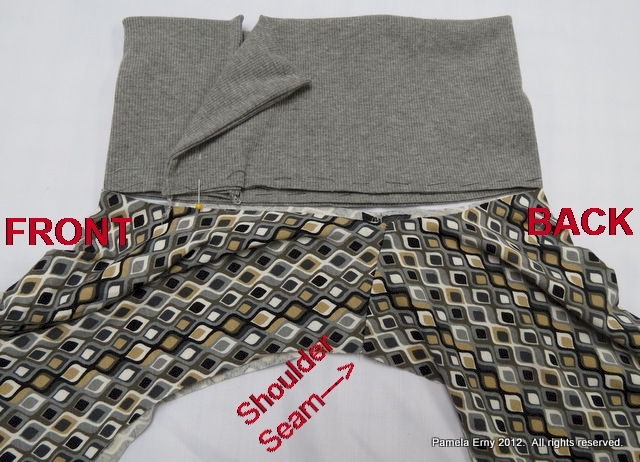 In the photo below, the shirt is folded in half, matching the shoulder seams and the neck-edges. 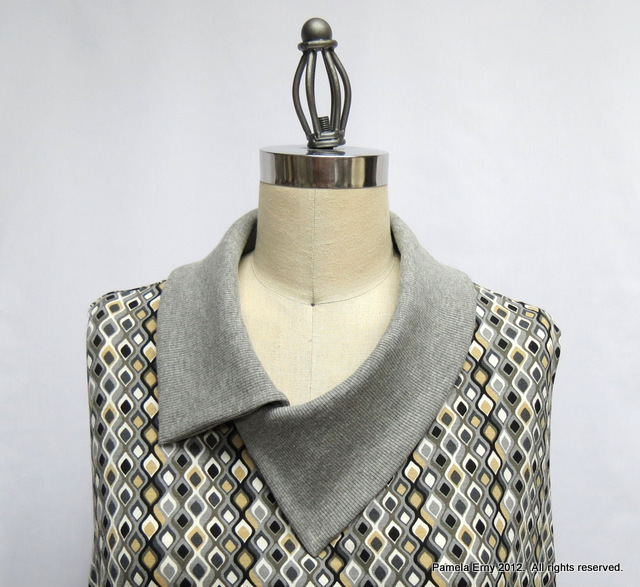 The collar is folded in half as well and compared against the neckline, as a guideline for how much to overlap the collar....and where to place the overlap (which is your choice..it can be placed wherever you want it to be). Then, as was done with the "test" collar, the collar is "dropped into the hole" of the neckline...right sides together, all raw edges even. The collar is stitched to the neckline with a 1/4-inch seam by sewing machine or serger. 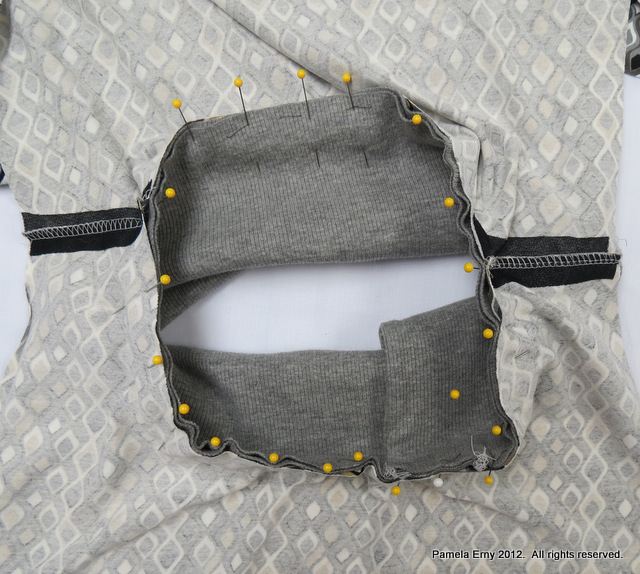 The seam can be left as is, however I like to finish the seam so that it lays flat by top-stitching it down from the right side, as shown below. As you look at the photograph above...are you wondering how a collar that is the same length on each short side, now looks like one edge is quite a bit longer and...that now, somehow, the collar is asymmetric? Here's why: The upper side of the overlap is exactly that...an OVER-lap. 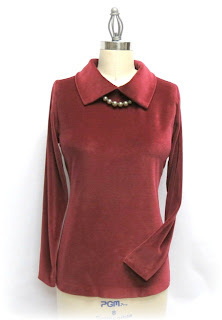 This red velour top was made with a more shallow front curve, about 4" deep. The collar was cut about 9" wide, with No overlap. The collar was fully interfaced with Pro-Sheer Elegance Fusible Interfacing from www.FashionSewingSupply.com so that it stands up on the neck a bit. 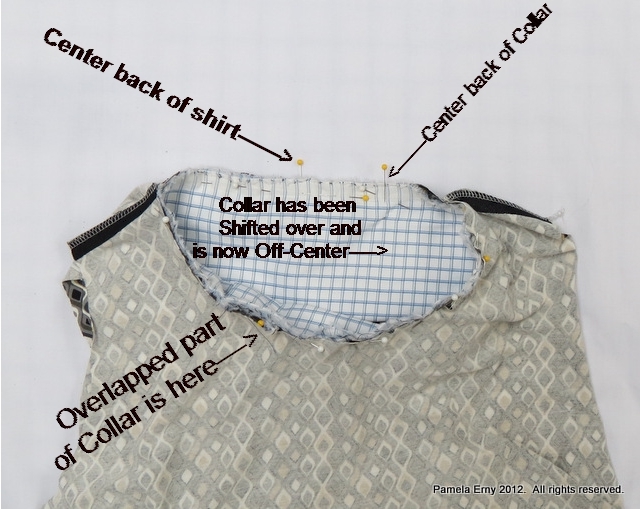 Additionally, because the collar was interfaced, the entire neck-edge and shoulders were reinforced with a 3/4-inch wide strip of the same interfacing, as shown below. This version in Aqua stretch velour features a deeper U-shaped neckline, and the collar was cut about 8" wide with No overlap. This collar was applied to a neckline about as shallow as the Red top, and has about a 4" overlap and is the widest of the examples shown, it's width is approximately 12". I hope you enjoyed this tutorial and see what a simple technique this is for adding an interesting design feature to any basic knit top!